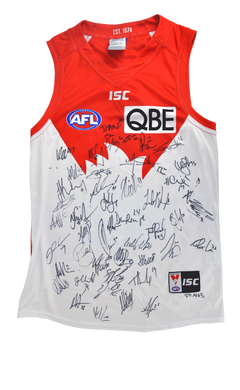 Don't miss this opportunity to own a 2015 team guernsey signed by the entire 2015 Sydney Swans squad. Guernsey is player cut home guernsey with the number 33 sublimated into the back. BID or BUY NOW for $150. Auction closes at 8pm on the 22nd of November 2018 (AEDT). Reserve for this guernsey is set at $100.